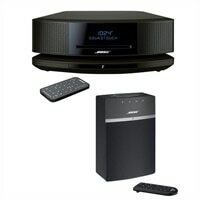 Bose - Wave Sound Touch music system IV + Sound Touch 10 Audio System - Espresso BlackThis bundle includes an audio system and a speaker. Bose Wave SoundTouch music system IV. There's a world of music out there. This compact system lets you easily enjoy all of it. Use it to stream millions of songs from music services, Internet radio stations and the music, stored on your smartphone, tablet or computer. There's also a CD player and AM/FM radio tuner. So you can hear whatever you want with room-filling Wave sound - all from an easy-to-use system with a fresh, updated design. This bundle includes an audio system and a speaker.